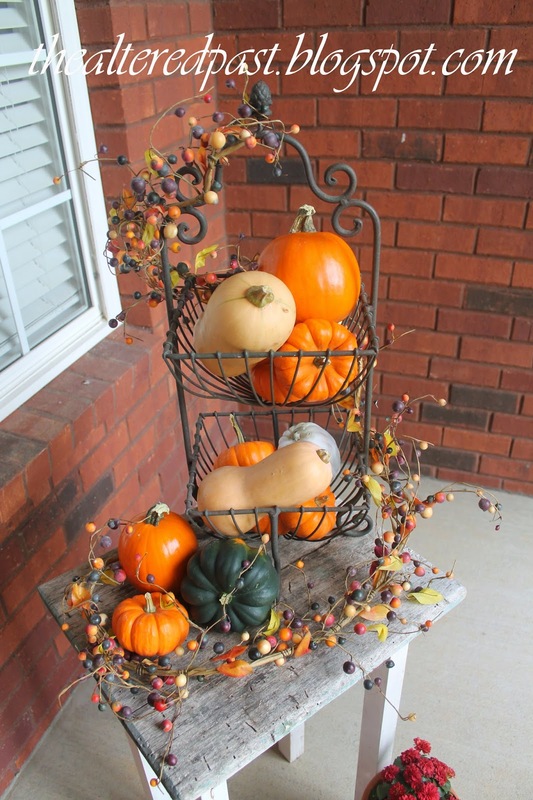 Believe it or not, I'm preparing slowly for Thanksgiving. Every other year, I host my husband's family. That's about 35 people. The decorating starts early with my fall decor and I slowly add Thanksgiving themed pieces as we get closer. Starting early allows me time to concentrate on housecleaning and cooking as the day gets closer. 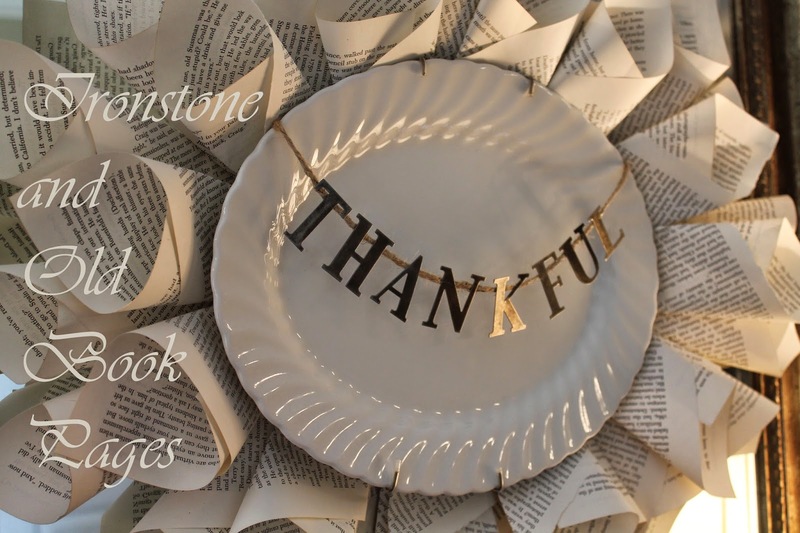 Recently I made this book page "charger" for one of my ironstone platters. 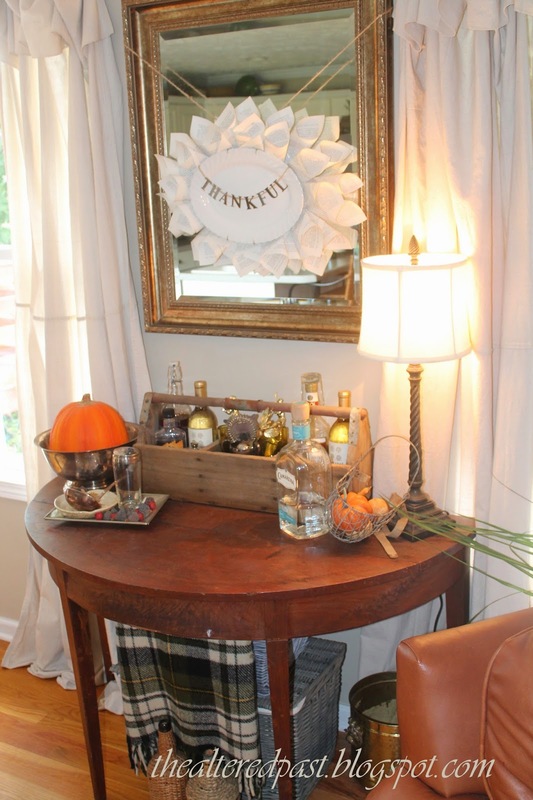 My original thought was to use it as a centerpiece but I liked the look of it hanging on the mirror better. 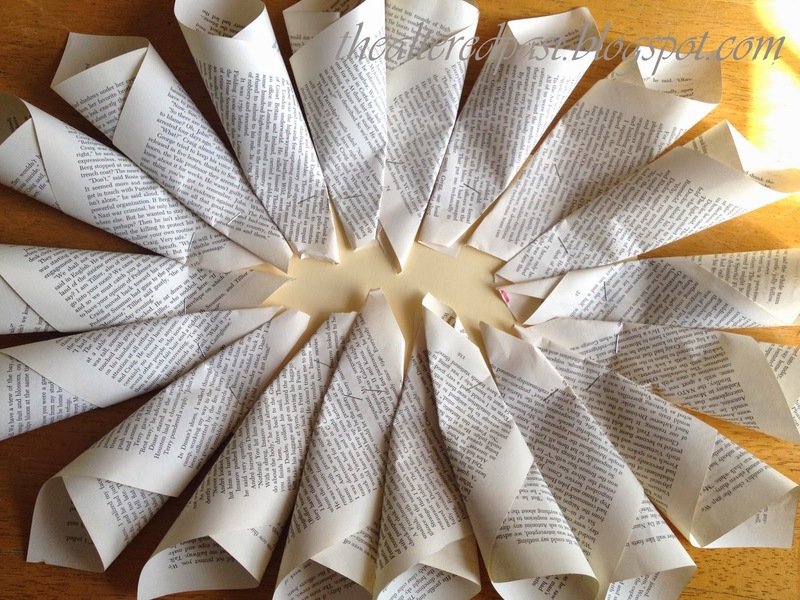 If you've never made a book page wreath, it's pretty simple. 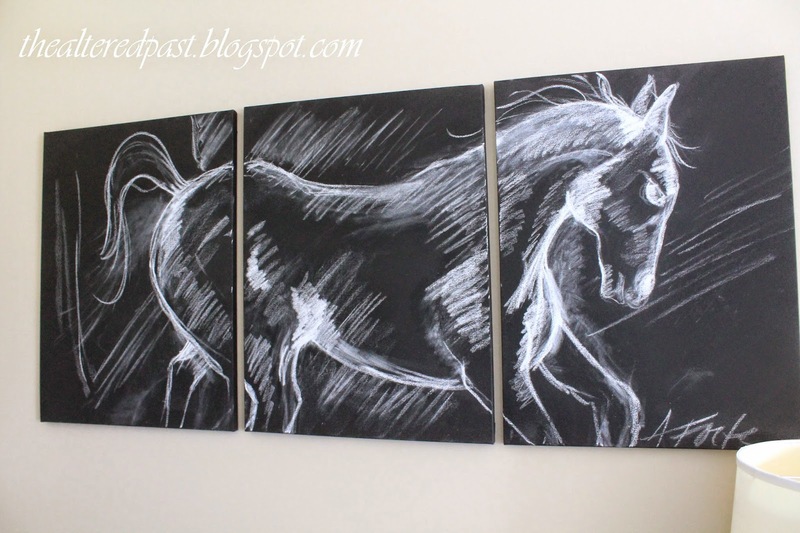 A great project to do while watching tv, especially if you're making a large one. 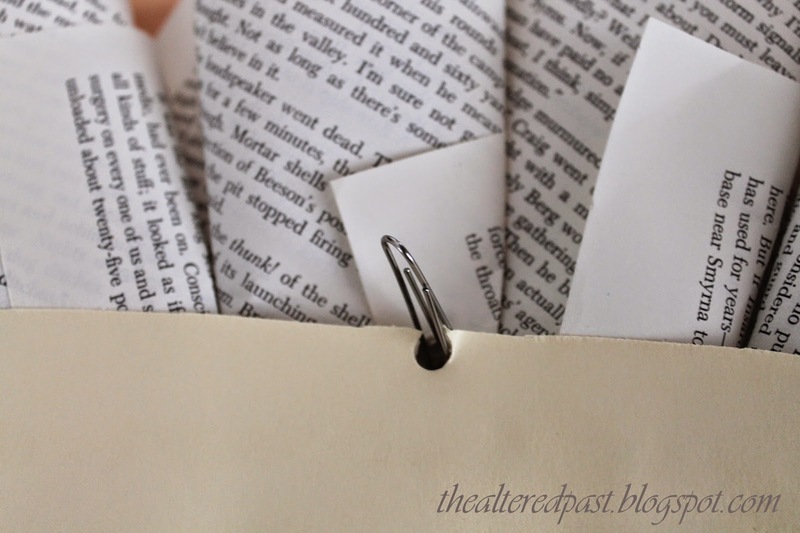 Begin by ripping out the pages. I used 30 for this project. 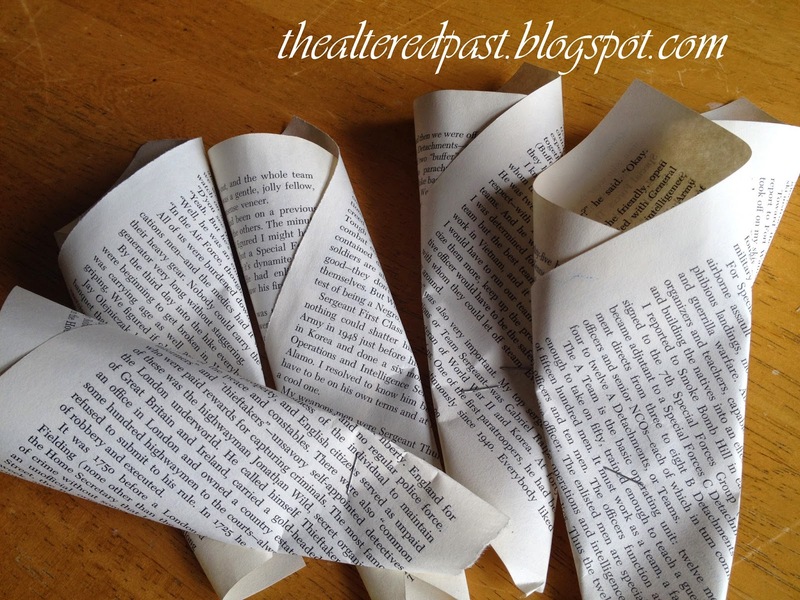 Once you have your pages out, begin making the cone shapes. The easiest way to get the right look is to turn the page upside down in front of you, lay your hand (palm up) on the upper right corner, grab the right side and roll your hand to the left. You can tweak it to line the edges up if you want. 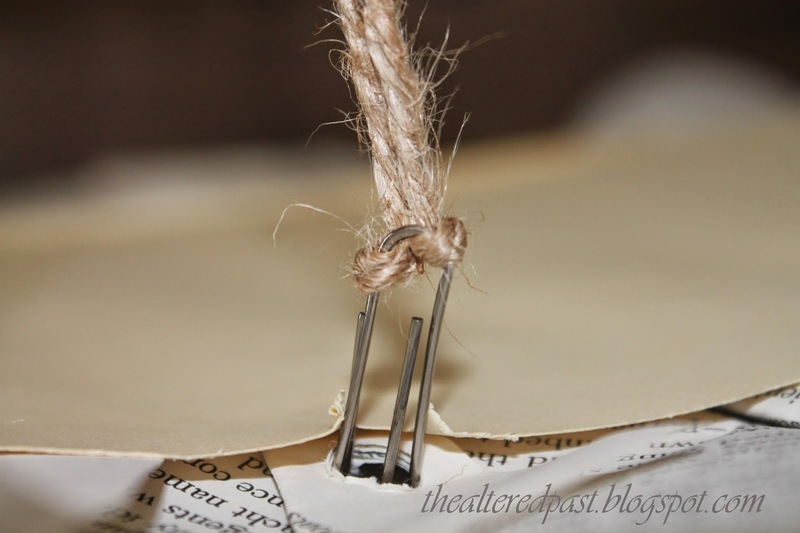 Once the page is rolled into the cone shape, staple it a couple of inches from the bottom. Don't worry if it creased near the bottom. The top is what you want to remain uncreased. 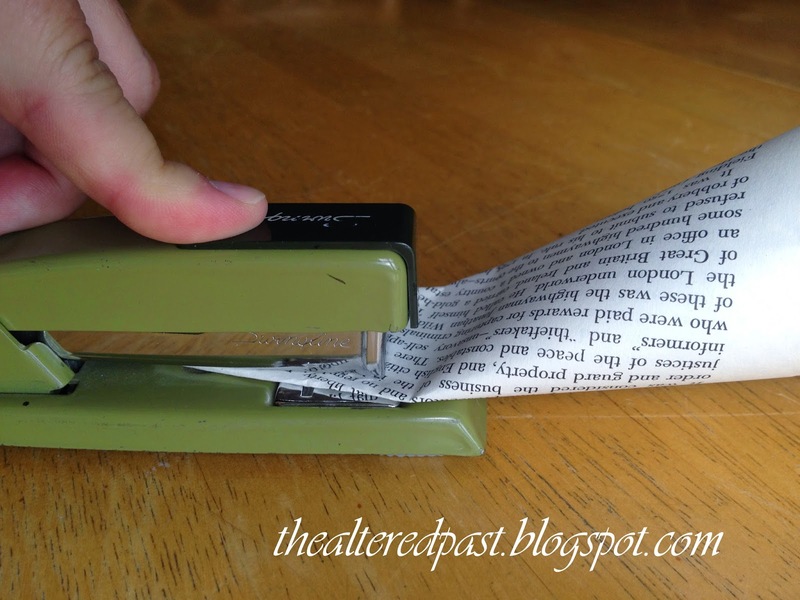 Continue rolling and stapling until you have 30 pages. Cut your cardboard the size of your platter, roughly. It doesn't have to be exact. 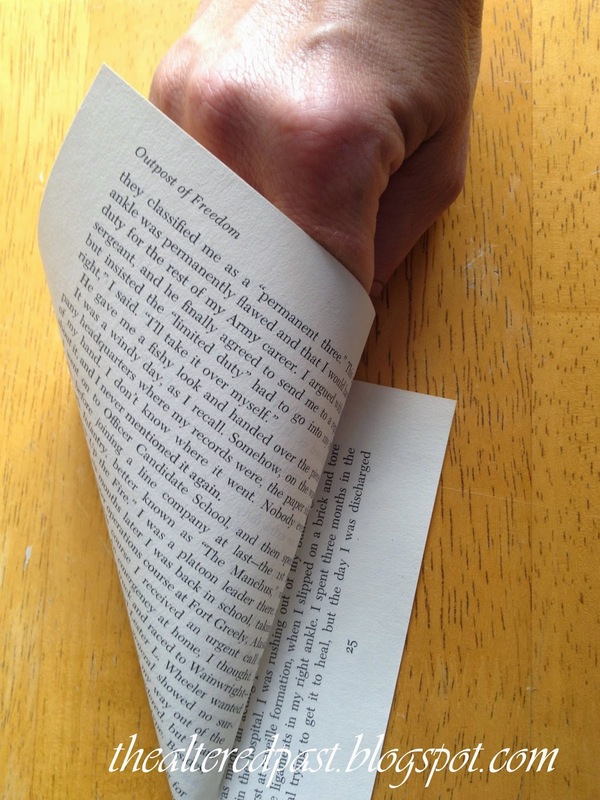 Then, begin gluing your pages around the edge of the cardboard. You'll want to adhere the pages near the stapled area to the outer edge of your cardboard oval. You can lay them out to get a feel for the shape. 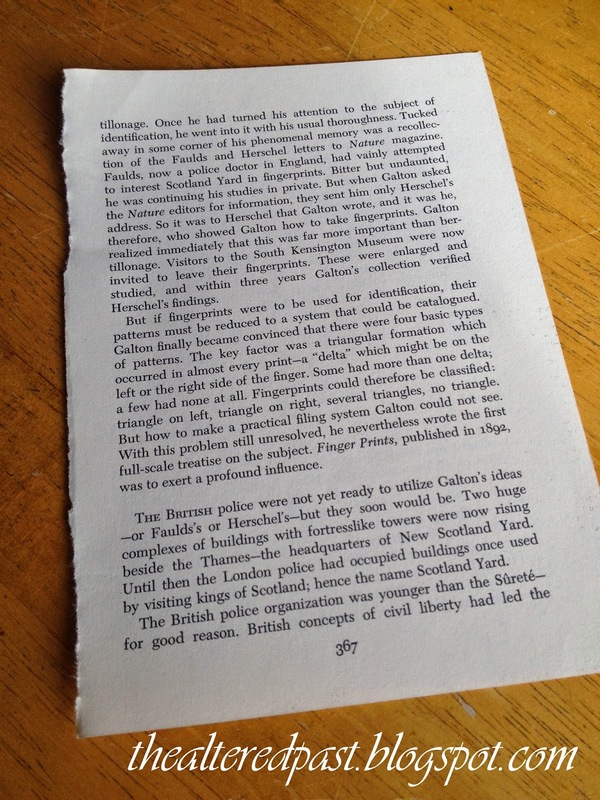 Only the open end of the book page will be seen so it's okay if they overlap and aren't glued perfectly. It will take a little over half of your pages for this layer. 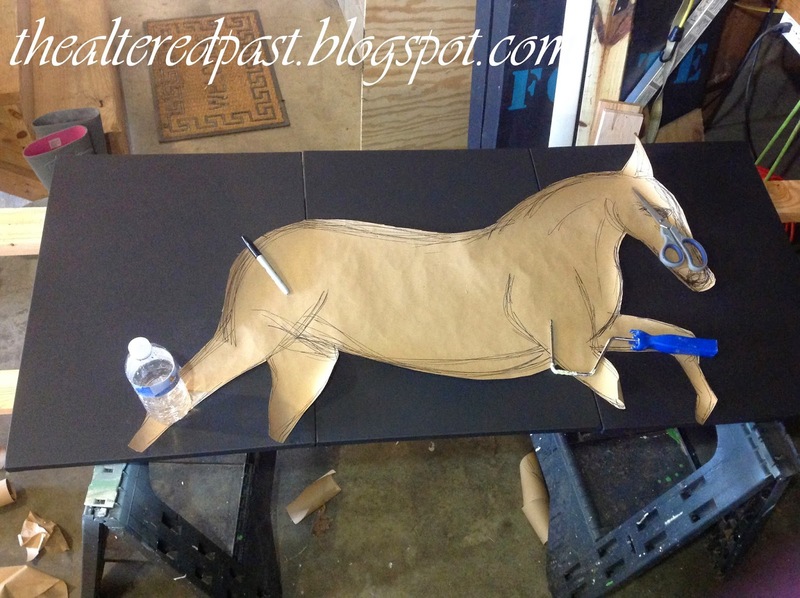 If you're using white glue, you'll want to let this layer dry before adding the next one. I placed the platter and a pot on top of mine to press it down until the glue was set. Once it's dry, repeat gluing the book pages for the next layer, only this time you will glue them closer to the center of the cardboard. 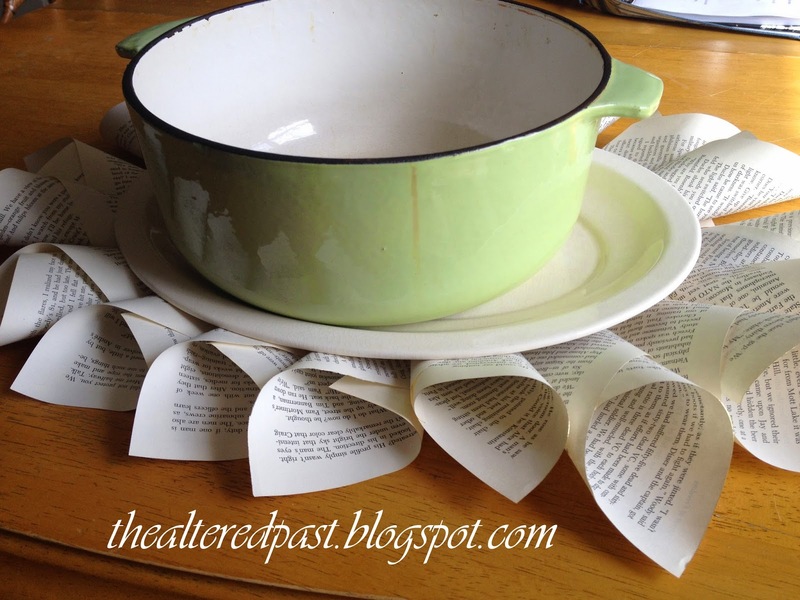 This helps create the cozy nest your platter will go in when finished. Now, if you want to use this as a charger for your platter, you're done! 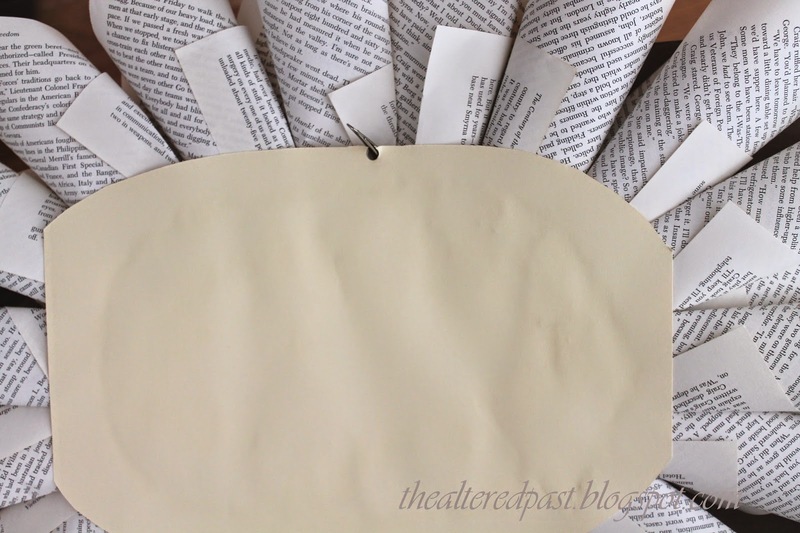 Add your platter to the center and begin decorating. If you want it to hang, continue with the instructions below. This may get a little tricky but stick with me. To hang, use a normal wire plate hanger on your platter. Loop a paperclip through the hanger where the nail would usually sit. You're going to slip the paperclip through a hole in the charger so that you can hang it. To line up where the hole in the charger should be, place your platter on the charger, feel for the spot where the paperclip hits the book pages and then mark it. This is where you'll punch your hole. 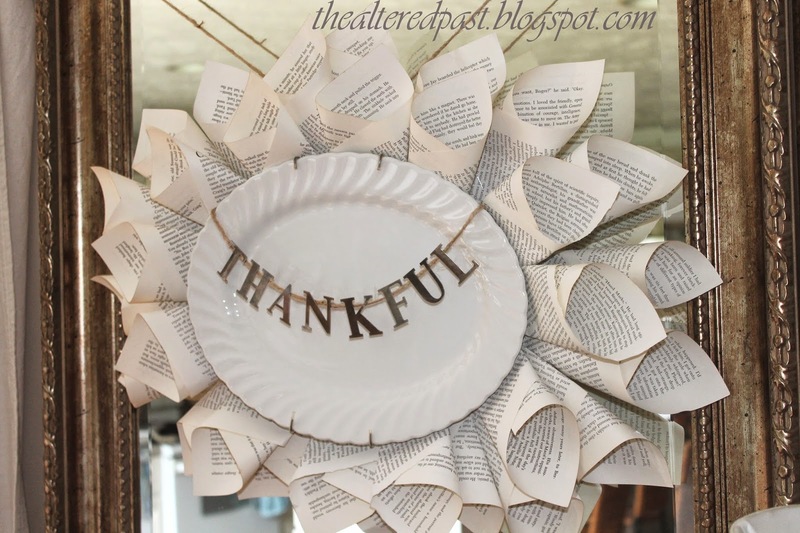 I had to punch holes through both layers of the book pages and some of the cardboard. After you've punch the holes, lay the platter back on the charger and put the paperclip through the hole. Here's the paperclip once it was slipped through the hole. I chose jute to hang mine from. For my mirror, I took 2 yards of jute, double knotted the ends, then slipped it through the paperclip. Remember this is actually attached to the plate hanger on the platter so it will hold the weight. The charger is simply hanging between the platter and the jute. Now find a place to hang it! 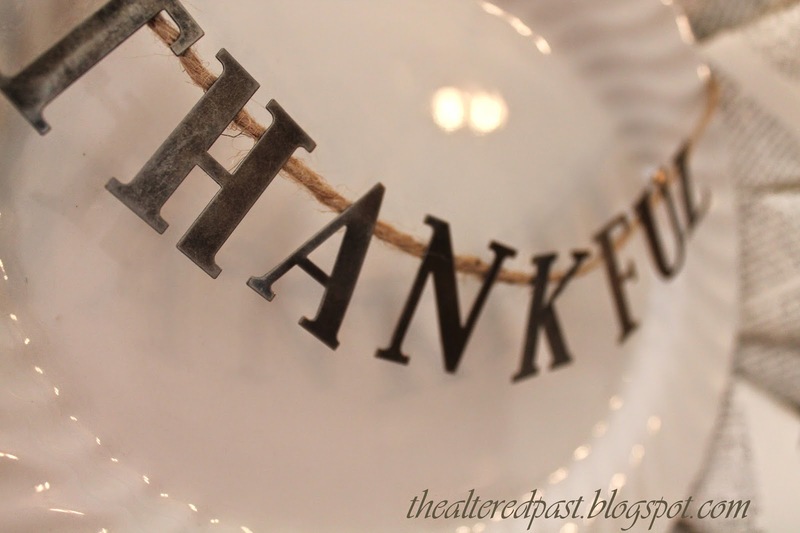 I embellished my platter with this little garland made from jute and metal letters found in the scrapbooking area of the craft store. 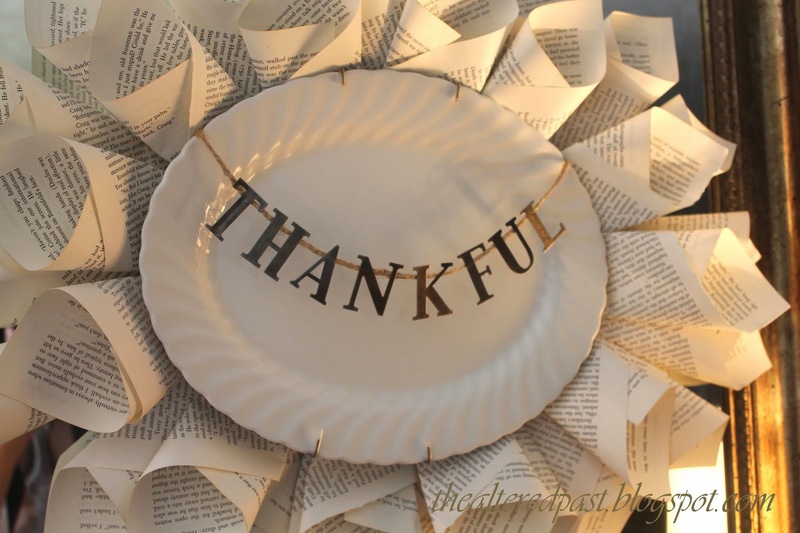 I just taped the garland to the back of the platter with washi tape. 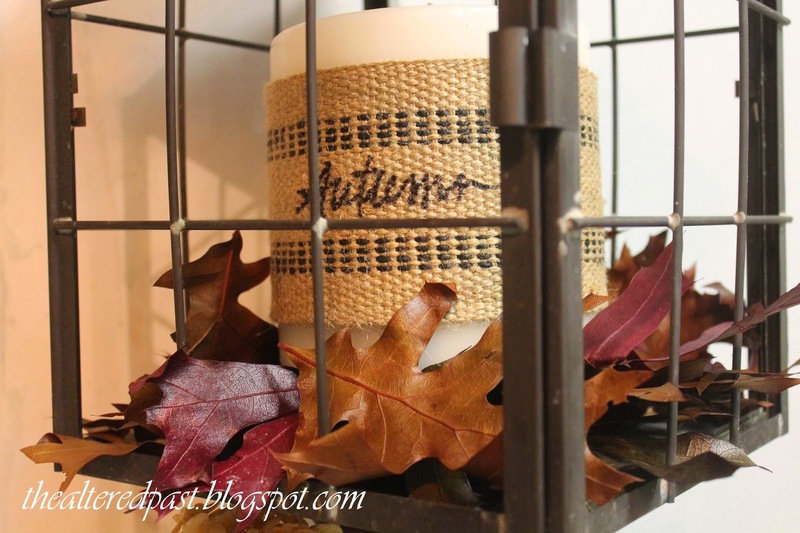 I added a little fall decor to the table below as well. 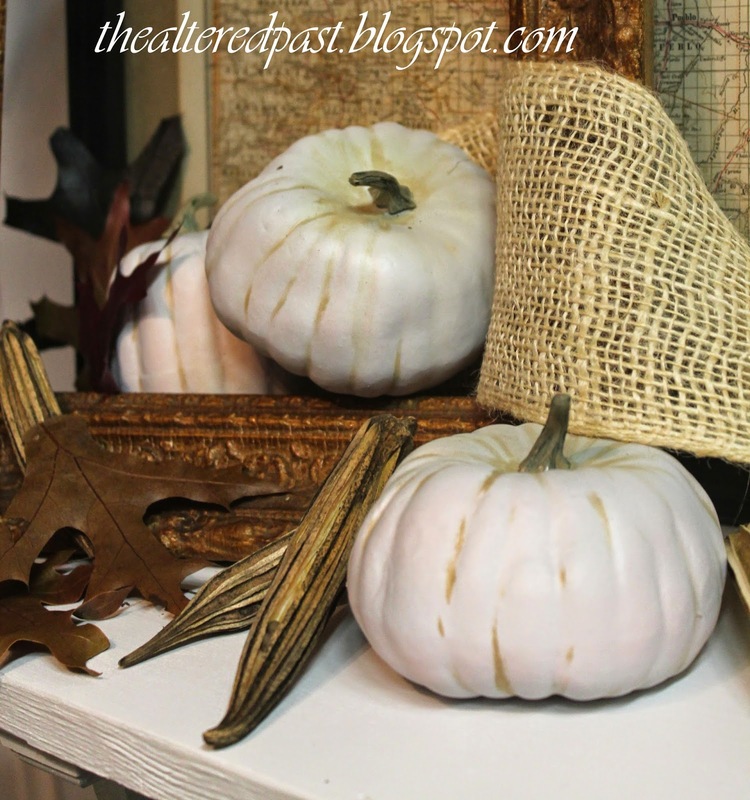 Do you host Thanksgiving at your house? I'd be super excited if you wanted to add this to Pinterest! Click the Pin button on the sidebar at the top! Thanks so much! 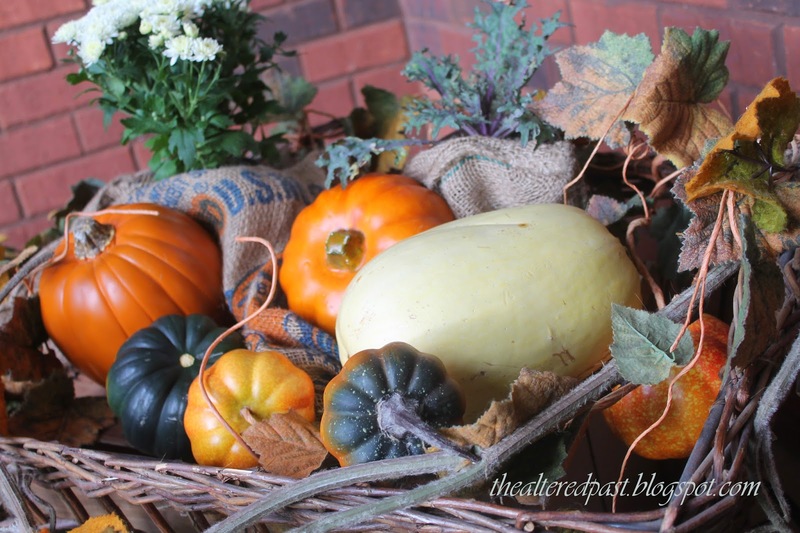 Welcome to our final week of the (most awesome) Fall Blog Tour! 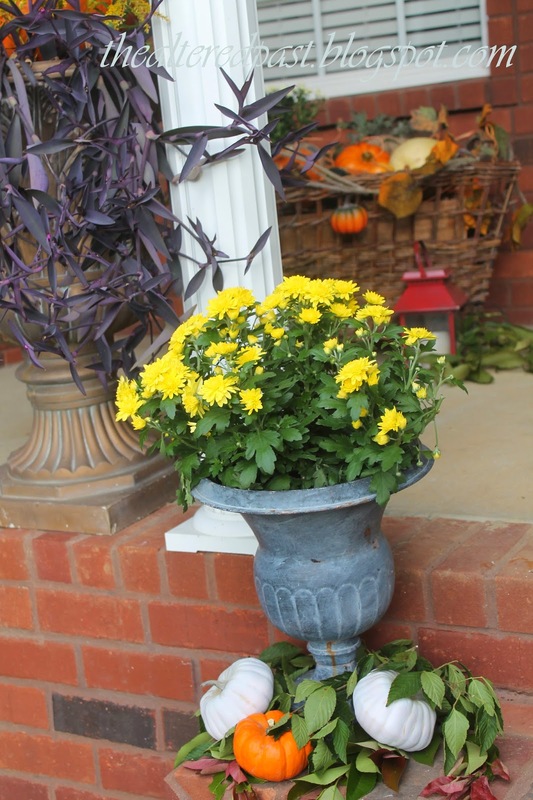 This week is our theme is Front Porch Fall Decor. 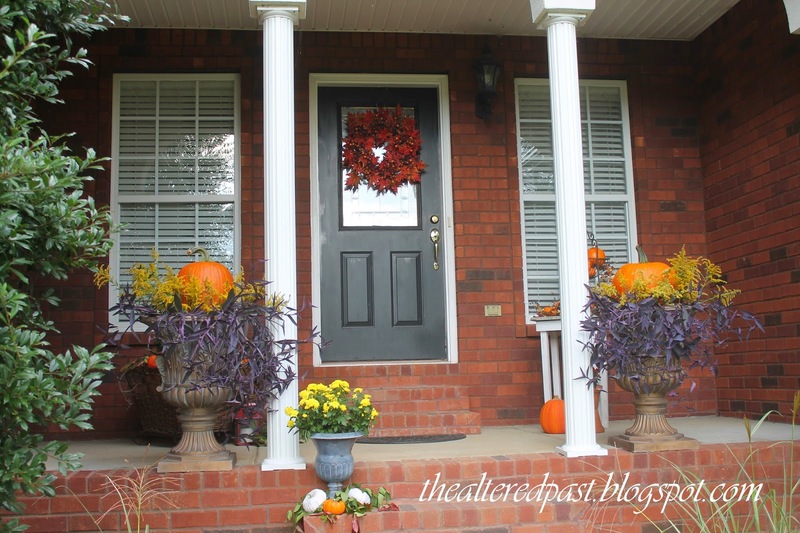 If you missed the first two posts, check out The Striped House with her amazing trailing vine and metallic pumpkins (loved them!) 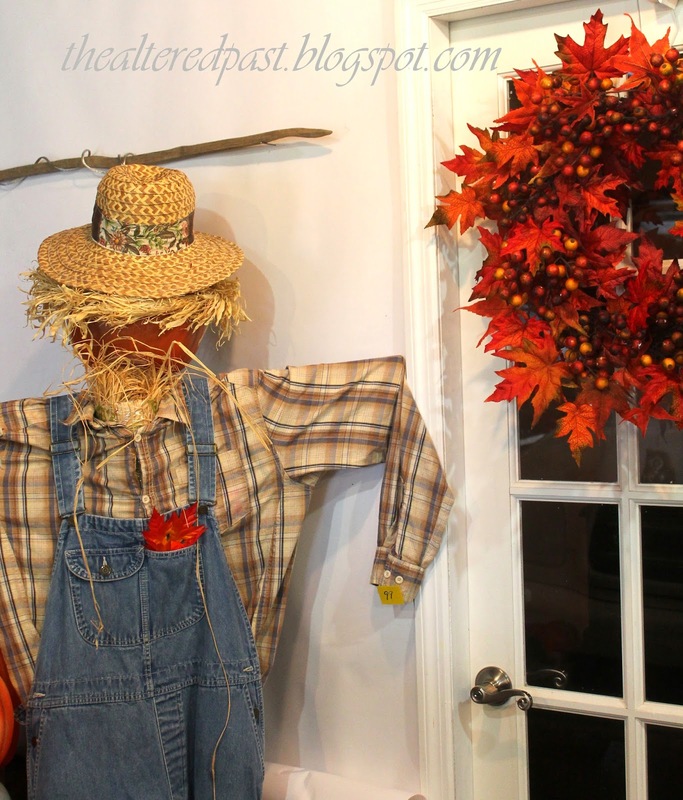 and Concord Cottage with her adorable cottage porch decorated with vintage rake and pitch fork (totally jealous!). Two different but equally beautiful styles. 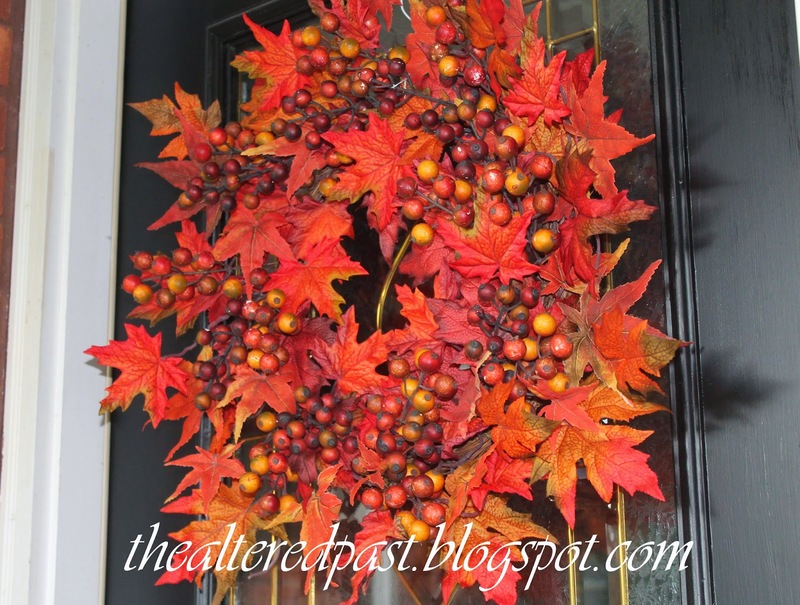 I found this beautiful wreath at a discount store on clearance for $7! After season sales are the best! 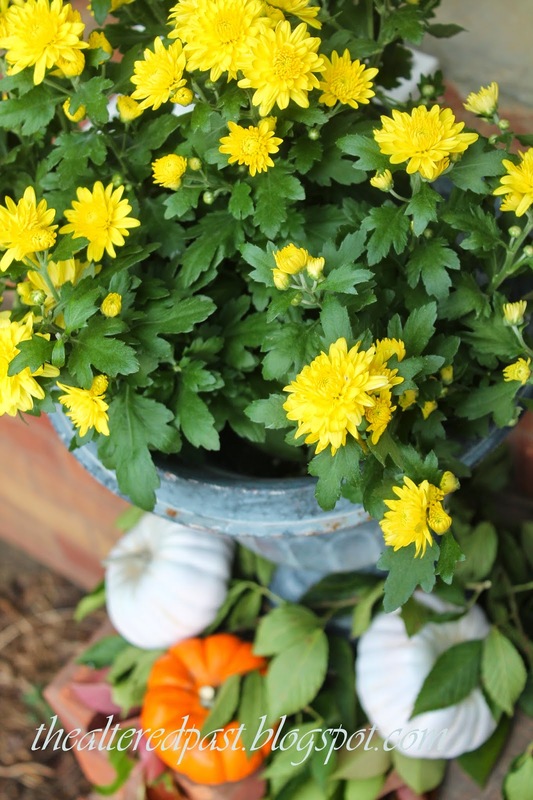 Yellow mums, white and orange mini pumpkins, and wild blackberry leaves. 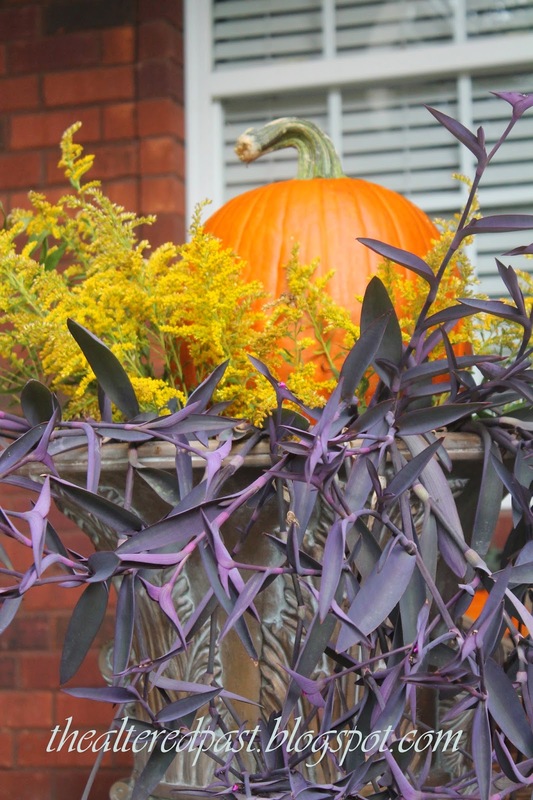 I usually plant my large urns with purple wandering jew each spring. 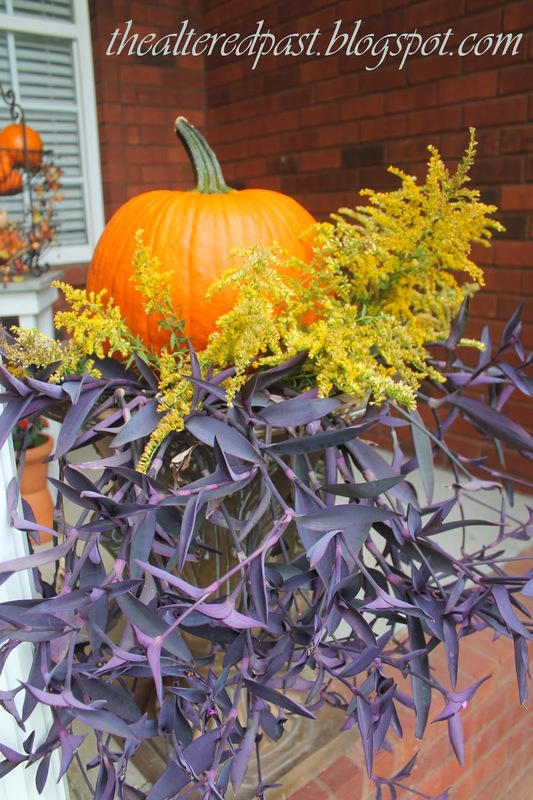 I hated to pull them out even though they will be killed with the first frost so I used them with the large pumpkin and goldenrod. 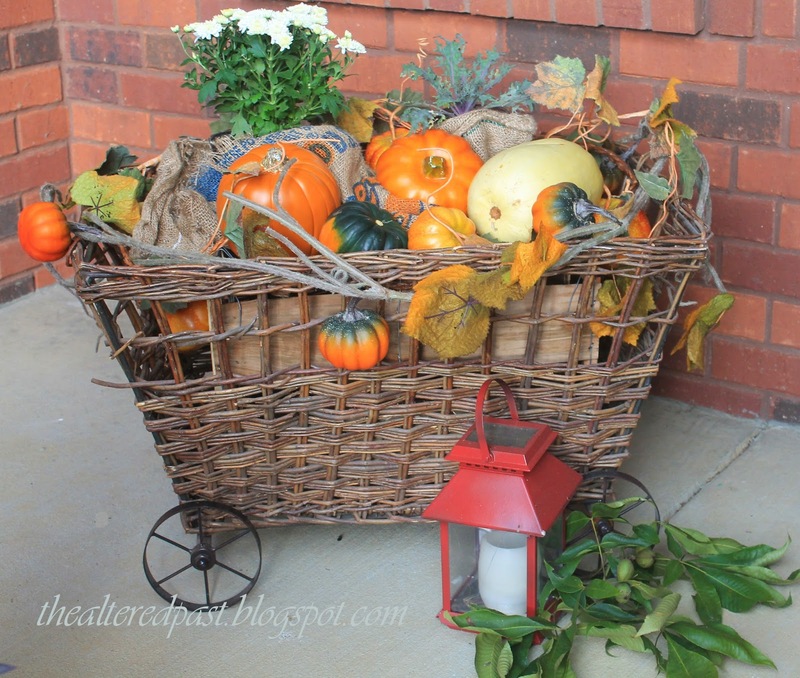 The harvest basket was also a discount store clearance sale find many years ago. 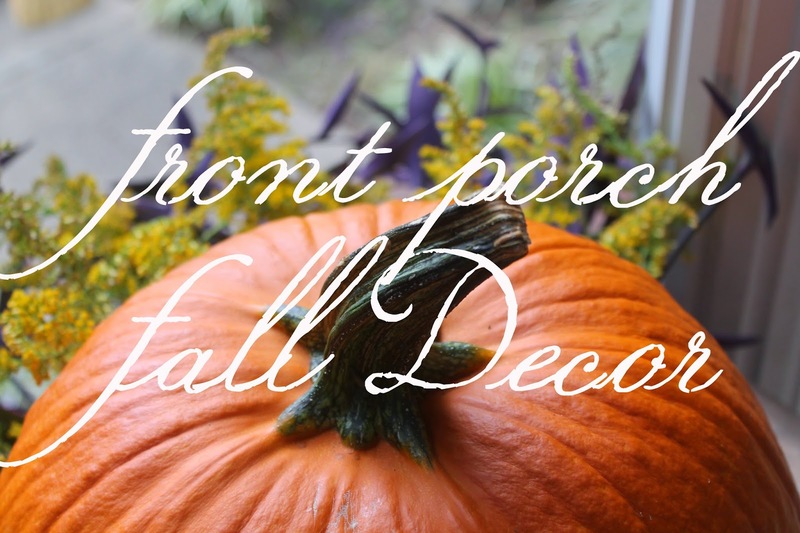 I love using it on the porch during the fall and near the fireplace holding quilts during the winter. This sweet table was built for me by my oldest daughter about 13 years ago. We lived in a tiny town (pop. 300), in a tiny old house. 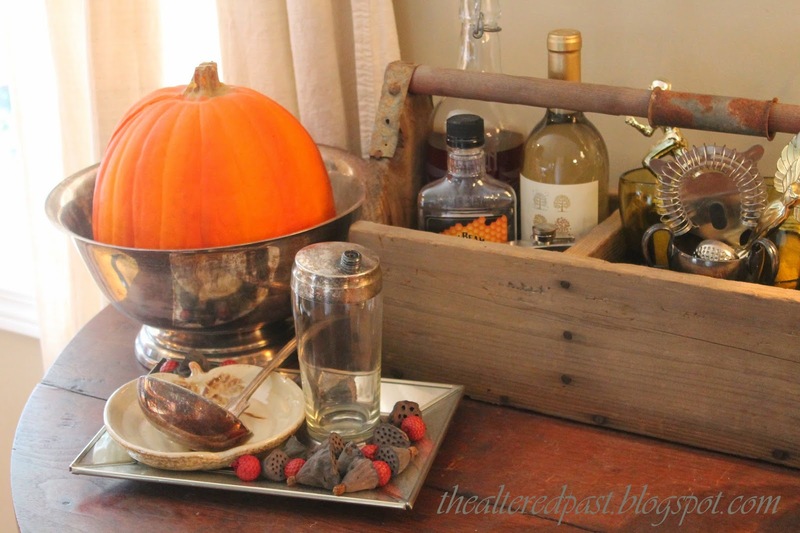 There was an old table on the back porch when we bought the house and I loved it. Unfortunately, it had been on the back porch for many years and had lots of damage. My daughter, with my husband's help, took the old table apart and was able to salvage enough wood into this little table. She surprised me with it as a gift. The green paint, worm holes, and knicks are all original and, of course, being refurbished by one of my daughters, make it very charming and special. Well, that's it for my front porch. 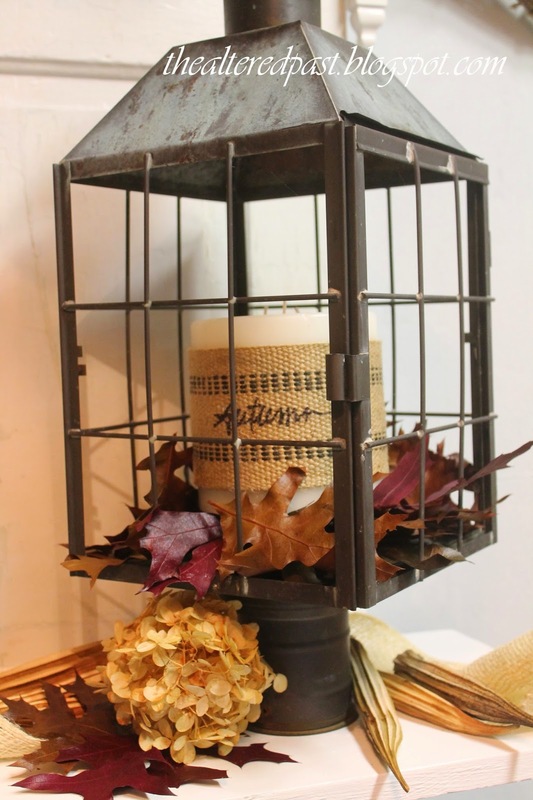 Have you pulled out your fall decor yet?! The temperature here is finally staying cool and I love it. 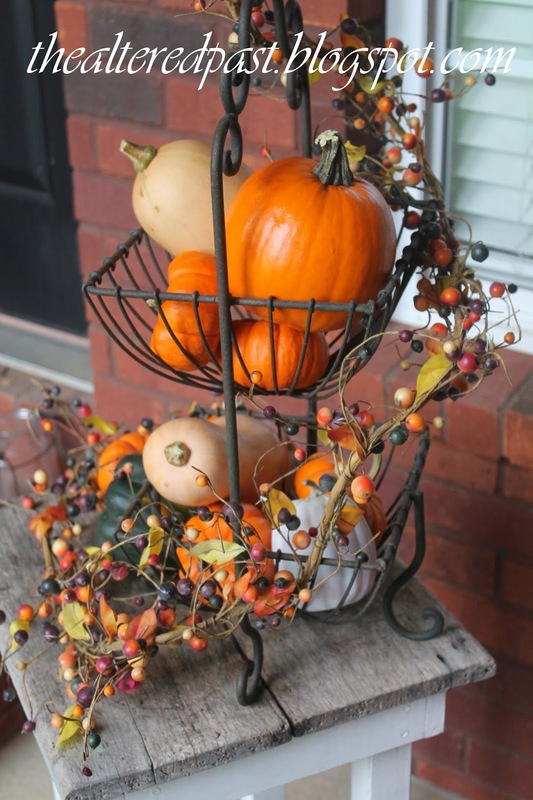 Fall is my favorite season. Be sure to check in with 2 Bees in a Pod tomorrow! Then our tour will finish out with The Crowned Goat on Friday and BluWaterLife on Saturday! If you'd like to add this post to Pinterest, please click on the Pin link in the sidebar. Thanks!! Do you know the history of the pocket square? It actually goes all the way back to ancient times, up through the late 1700's when, it is said, Marie Antoinette convinced her husband, Louis XVI, to command that all handkerchiefs be 16 x 16 inch square. Carried by true gentlemen, they were the symbol of wealth and class. However, let's skip ahead a little to when they were actually used more for fashion not hygiene. The early years of the 20th century found style savvy gentlemen wearing pocket squares with sleek suits and hats. Its popularity remained over the next three decades before its use began to wane...until now. The pocket square is, once again, becoming the icon of style for the gentleman. The hit show, Mad Men, may have something to do with reviving the pocket square. Here in the South, my friends, Kristen and Travis, of Viola Gold, are helping reintroduce this throwback trend. Named for Travis' tiny hometown of Viola, Tennessee, the company began in March of this year and has been a big hit with the 20-somethings on up. Viola Gold offers pocket squares made from high quality cotton and linen as well some that are repurposed from old shirts of great quality and design. Pocket squares are not only rich in history, they are stylish and versatile. Wear them with suits as well as more casual attire. From the board room to the Saturday afternoon tailgating party. And, ladies, they're not just for the men. The Viola Gold pocket square is for us too! Check out this stylish look! I know. These are great! AND, as a thank you to my wonderful readers, I'll be giving away one pocket square of your choice! Check out their website ViolaGold.com Then, enter below for your chance to win! 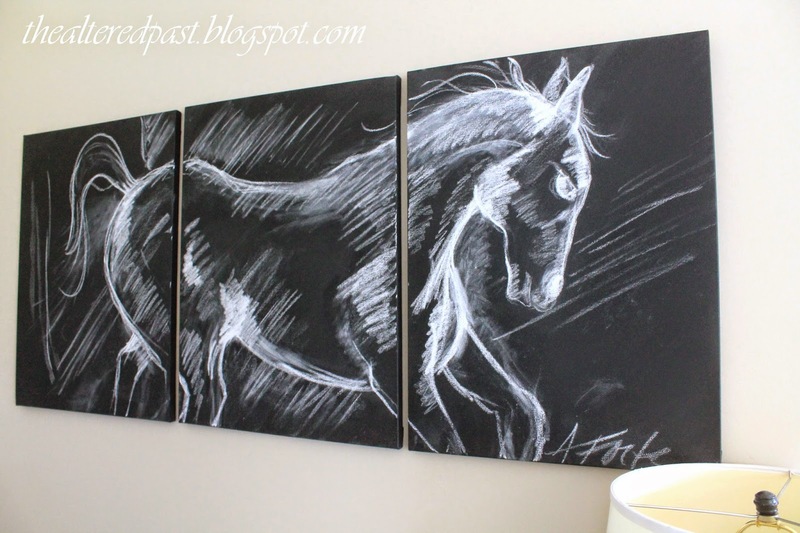 I've been surfing around Pottery Barn's website again and found a beautiful Plank Horse Triptych. I loved the simple gesture drawing in black and white. I knew I could probably do something like that with the 3 large canvases I had. I do like the plank look better but having had the canvases, using them just made sense. 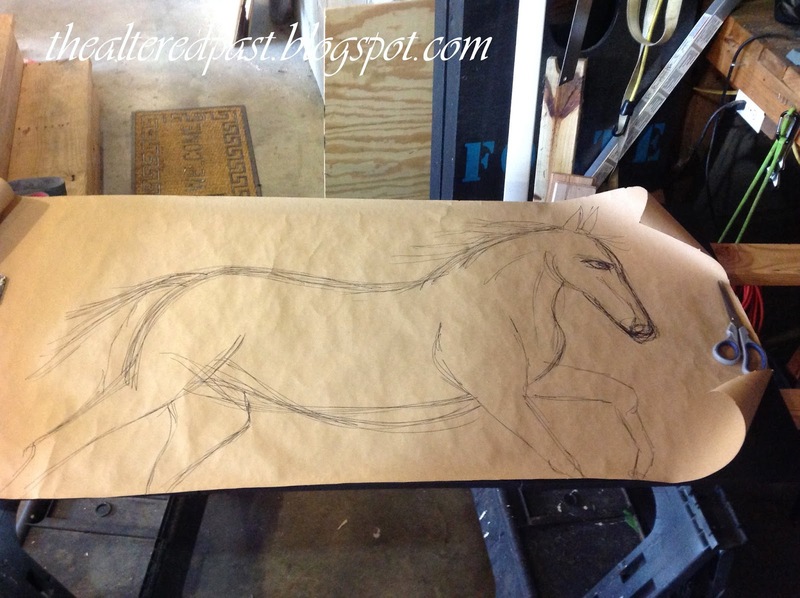 This project does require some degree of drawing skill. However, if you can copy and enlarge, you'll have no problem. 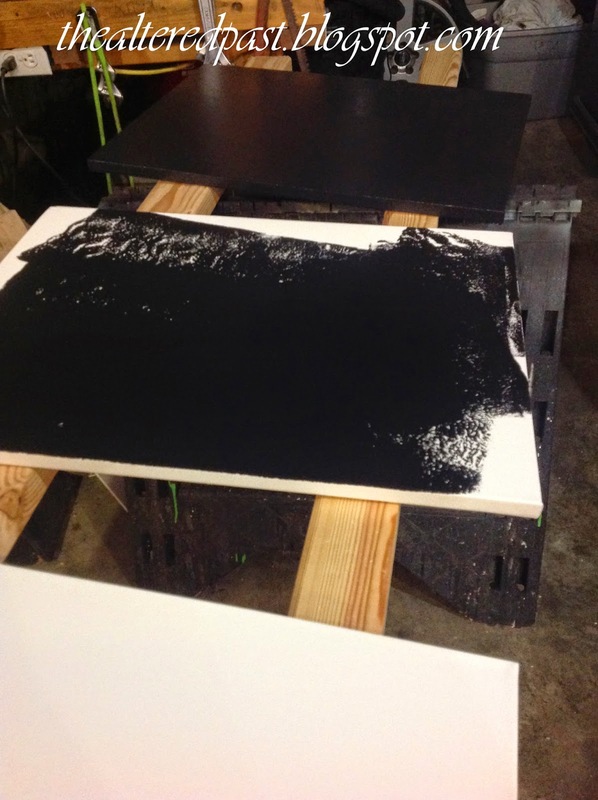 I began by painting all three of the canvases using flat black latex paint. Make sure to cover the white completely. Ok, here's my cheater step. 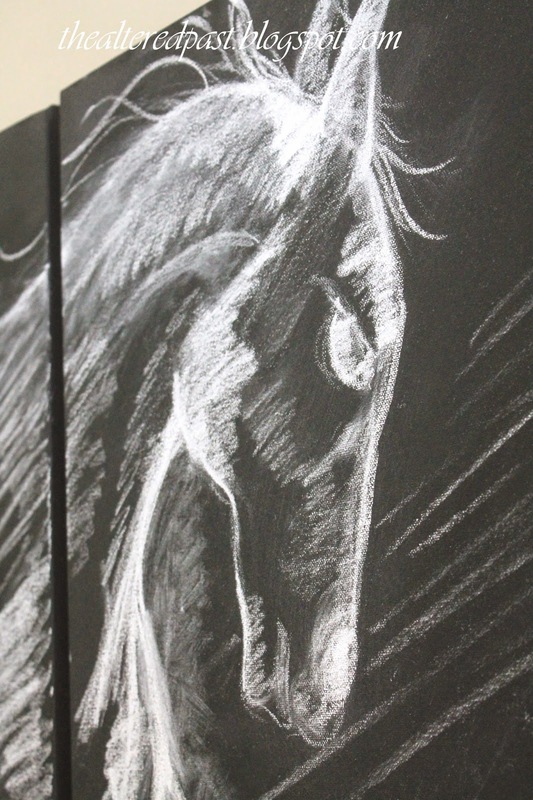 After laying the drawing over the canvases to check for position, I cut the image out so that I could lightly trace around it with chalk onto the canvases. Ok, seriously, don't be intimidated. The more you work with it, the better it will begin to look. I sketched and wiped off and sketched and wiped off many times. It really adds to the feel of the drawing. Once you're satisfied and done, you don't want to risk erasing your masterpiece accidentally. I used a clear spray sealer on mine. WARNING: Use several very light coats. 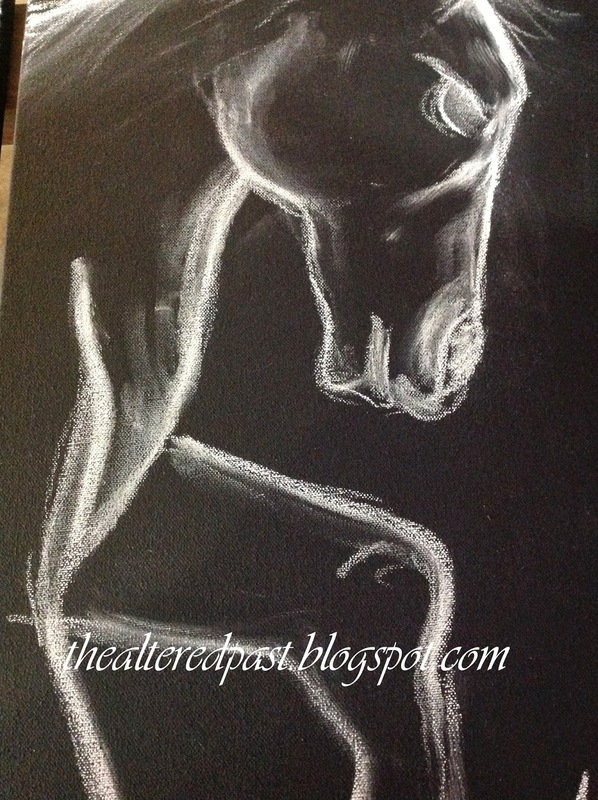 If you get the canvas too wet at once, it will "wash" away the chalk. I hope you give it a try. Remember, it's just chalk and paint. Don't like the horse, try something else. 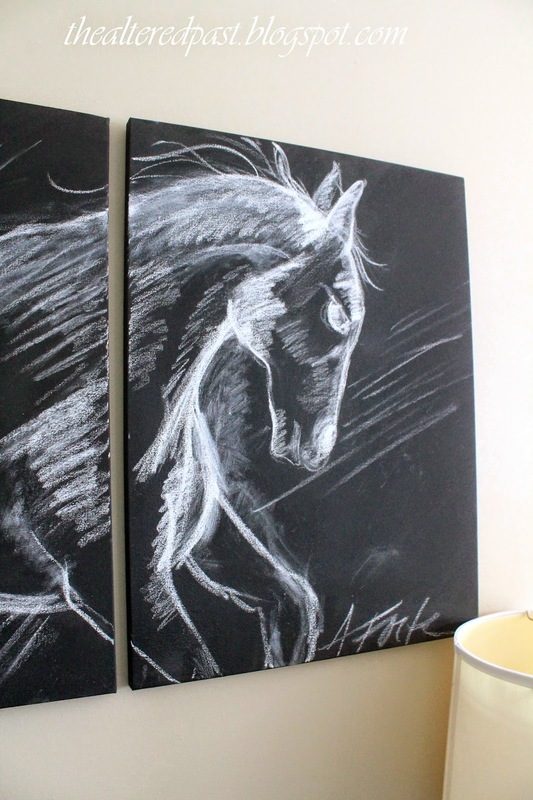 If all else fails, you've got three chalkboard ready canvases to use for a Scripture verse, quote, or menu! 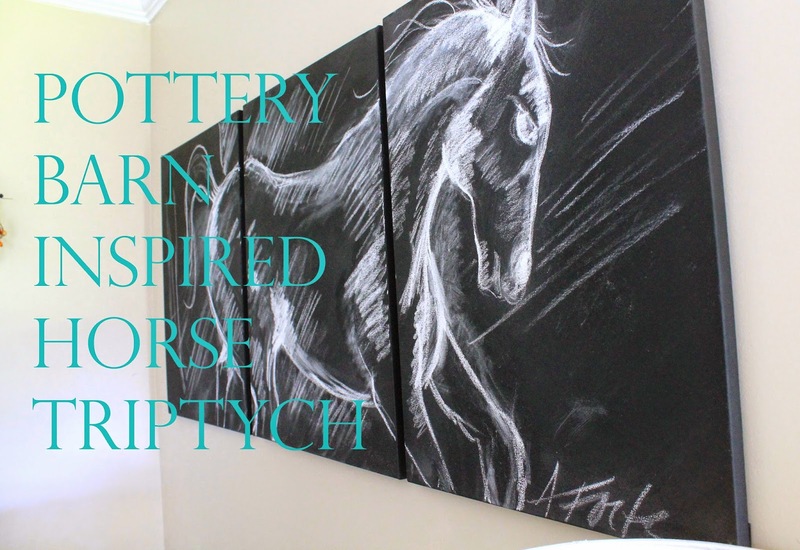 DISCLAIMER: My drawing was inspired by Pottery Barn's and I created it for my own personal use, not to be sold. Hey all! 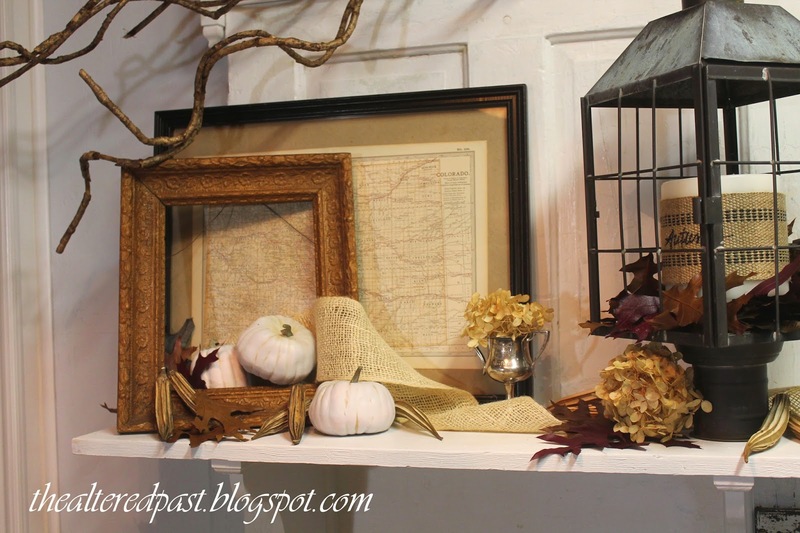 This is week 3 of our blog tour and it continues with fall mantel and shelf decorations. 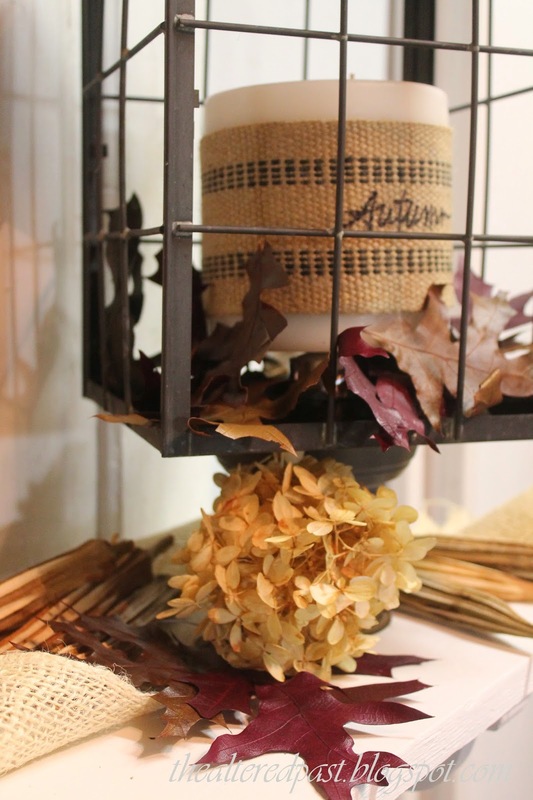 Jennifer of The Striped House began our week with her burlap, birch branches, and mercury glass...beautiful! 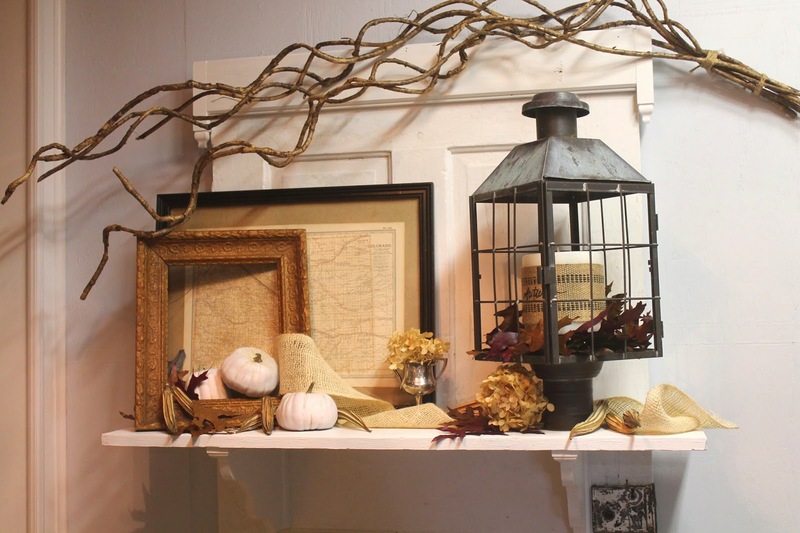 Yesterday, Lisa of Concord Cottage shared her easy, no sew banner that she added to her charming mantel along with candles, pumpkins, and beautiful empty frames...love that look. 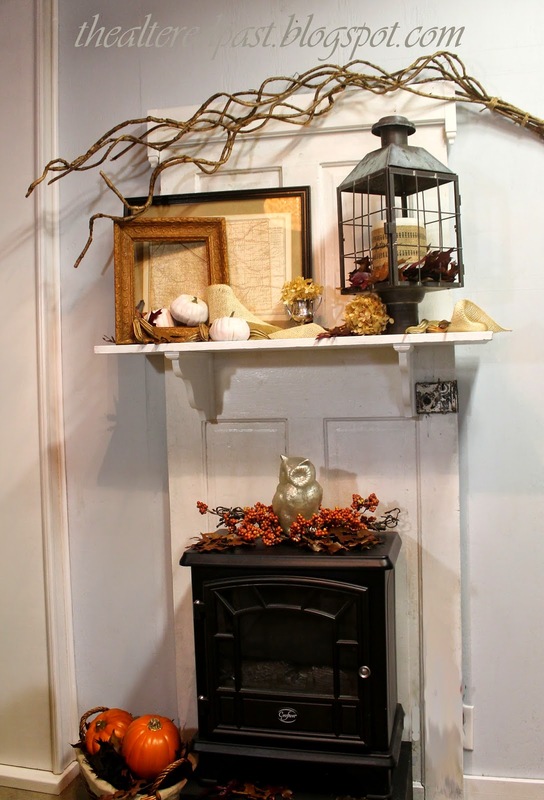 Today, I'm sharing a faux mantel. My real mantel is also home to a huge TV...not so lovely to decorate. 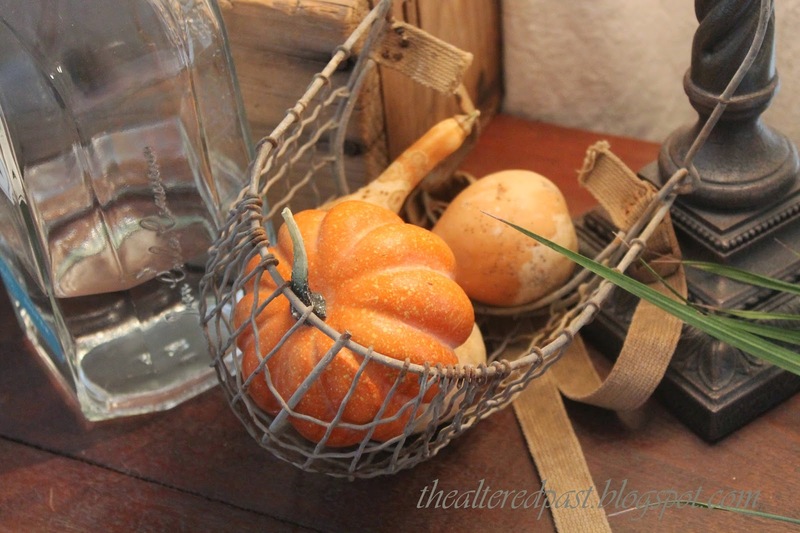 Here's a shot from my Fall 2012 post. You can see that I have a tiny spot on each side of the TV to decorate. I added the shelf and crown on top and it fits perfectly in my tiny 10x10 room. 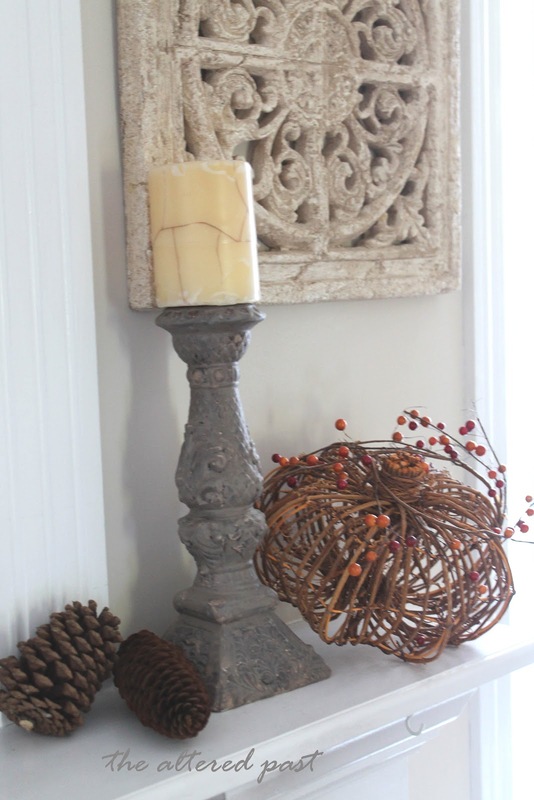 The decor theme is pretty neutral, using a lot of natural pieces. 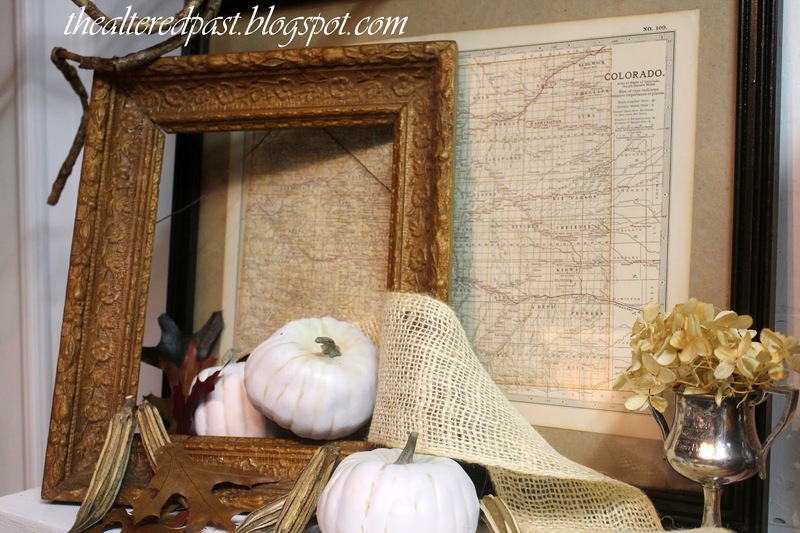 An old Colorado state map and a 1921 silver trophy, both found at a local thrift store. 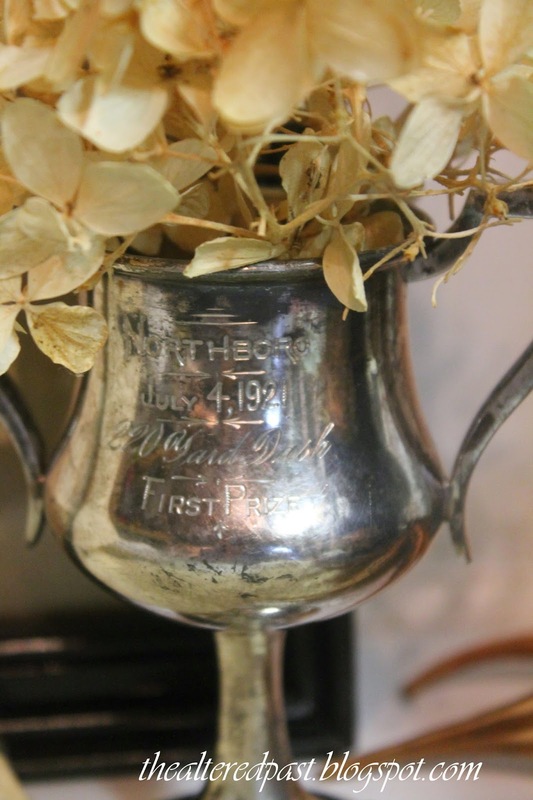 Isn't this old trophy adorable? From July 4, 1921, awarded for the 220 yard dash...love it! By the way, church rummage sales are the BEST sales around...lots of great stuff at great prices! That's it! 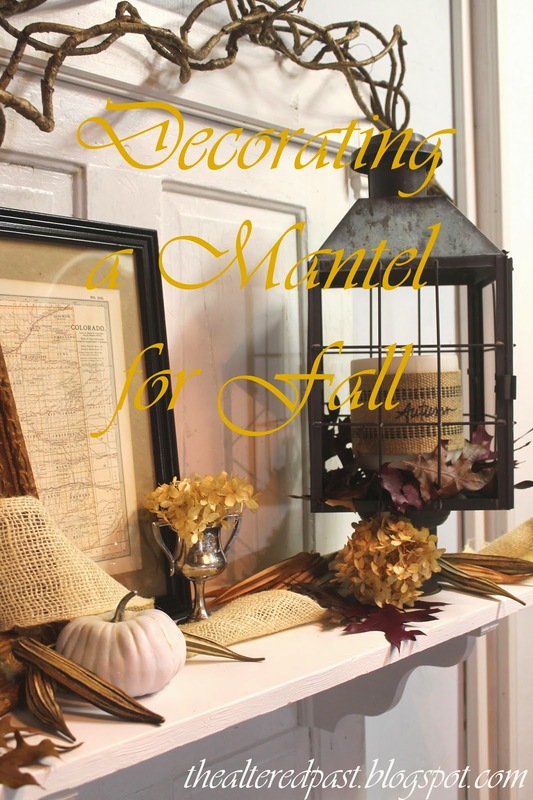 I hope you're enjoying our Fall Mantels week on the blog tour. Be sure to stop by 2 Bees in a Pod tomorrow! I know Jennifer and Vicki will have something amazing for us. Here's a pinnable pic for you (see Pin button at the top of sidebar). I appreciate it! 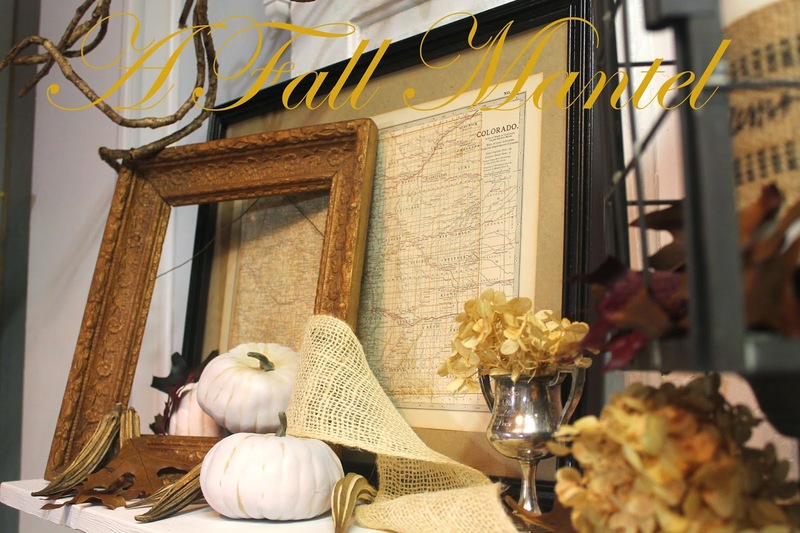 World Market Now Has a Blog!